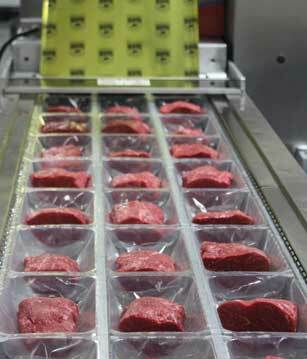 Beaver Street has its own on-site, USDA inspected, meat cutting and packaging facility. Our meat room’s team motto is “small enough to serve but large enough to fill any size order”, we offer a variety of quality meats including Beef, USDA Prime, Choice, and Select. Our sterile cutting room utilizes an Ozone International aqueous sanitation solution system, adheres to HACCP guidelines, and allows for custom cuts and sizes using state of the art machinery. All beef is aged for a minimum of 21 days and our frozen steaks have a minimum shelf life of 12 months. We ensure integrity and consistency in every box with the industry’s most extensive tracking system. Beaver Street maintains the highest quality of steaks with the greatest availability. Our meats start with you the customer in mind. We have USDA inspectors on site 5 days a week to inspect the meat and our meat room facilities. After each day of cutting, we sterilize the meat room and equipment to make sure there is no bacterium or cross contamination of the meat. We employ state of the art machinery that use laser guides to size up the meat and then cuts it to the desired thickness and to within 1/2 of an ounce of specifications. We can cut two different sizes in one sweep. when the meat has been processed from our cutting room which is at a constant 45 degrees, it then goes directly into our freezers (-2 degrees ) or coolers (34 degrees) to ensure the meat stays fresh and retains its #1 quality and tremendously robust flavor. Whether you are looking for a small get together or a magnificent gala for dignitaries, BSF's quality meat products delivers!